My grandma’s Easter soup is one of the only things I like about Easter. The recycler in me loves the very concept of this soup, described most scornfully by a hater here. (To whom I say: you should have had my great-grandma’s potato-ketchup soup if you want to thumb your nose at poverty cooking, yo.) 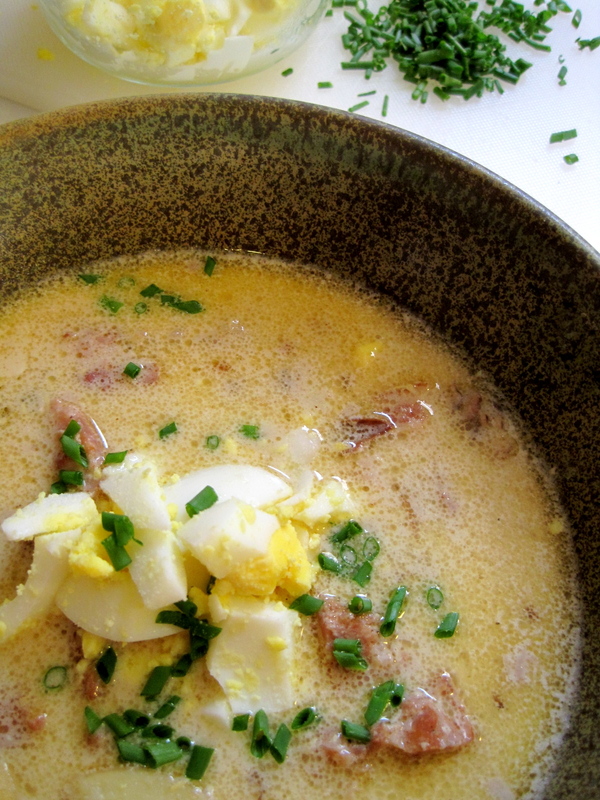 Polish Easter Soup, also called zhurek or white borsch, utilizes the broth made by cooking the Easter kielbasa, leftover ham and sausage, a few dried mushrooms, leftover hardboiled eggs, whey that was probably hanging around as a by-product of Farmer cheese-making (there’s your answer, Polish Easter Soup-hater! ), and the leftover liquid from a rye sourdough starter. The soup is thickened with sour cream blended with a bit of flour. I’ve always liked it in its simplest form, but this year I tried to bump up the flavor with Sweet Briar Farms spicy beer sausage (since I couldn’t find natural kielbasa), Russian fingerling potatoes, and fresh maitake mushrooms sauteed with bacon and the aforementioned beer sausage. I used a Guatemalan crema for the sour cream, and added some Tule Lake fresh horseradish and a splash of vinegar to balance the flavors. The hardboiled egg garnish was greenified by some garden chives, and each bowl of soup contained a dollop of additional horseradish. 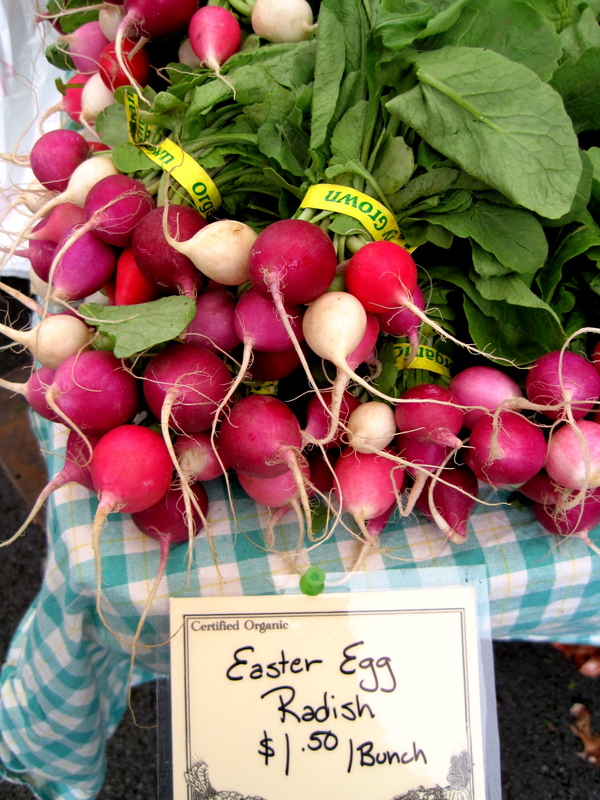 But if this doesn’t sound like your thing, I hope you hunted up some raw, fresh Easter Egg radishes as beautiful as these. Previous Article saturday farmer’s market opens, foodies go wild! We use vinegar too, but no cream of any sort, nor do we use potatoes or mushrooms. Everyone in my family loves easter soup and my husband has grown to like it over the years. All others hate it like poison. People either love it or hate it. I’m in the love-it category. Simmmering my kielbasa now as we type and getting it ready for the Easter soup tomorrow. You know a true foodie when they’re online looking up food when they’re not in the kitchen cooking it. LOL. 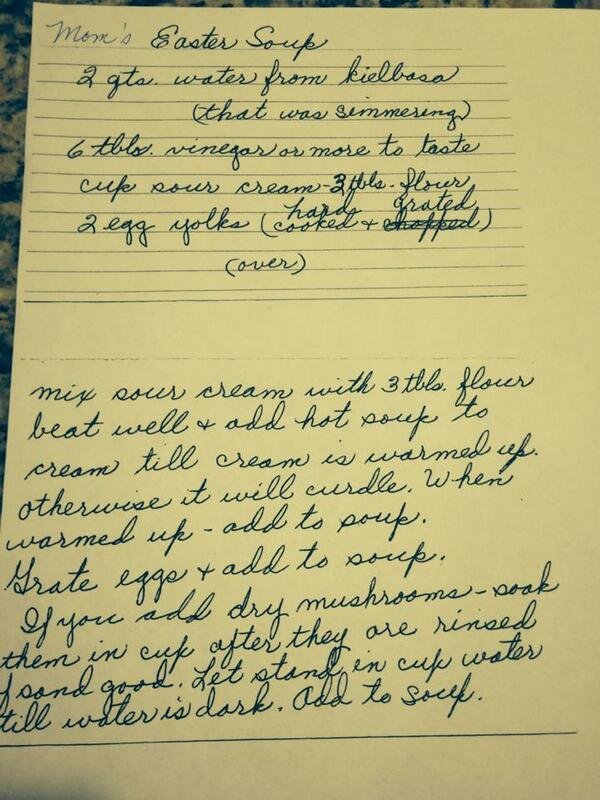 Although Gram’s mother was Polish, her father was Austrian and their recipes had a definite Germanic influence. Where is the instructions of the full recipe? ?